It is truly an ancient debate: Is it better to be active or contemplative? To do or to think? To make an impact, or to understand the world more deeply? Aristotle argued for contemplation as the highest state of human flourishing. But it was through action that his student Alexander the Great conquered the known world. Which should we aim at? Centuries later, this argument underlies a surprising number of the questions we face in contemporary life. Should students study the humanities, or train for a job? Should adults work for money or for meaning? And in tumultuous times, should any of us sit on the sidelines, pondering great books, or throw ourselves into protests and petition drives? 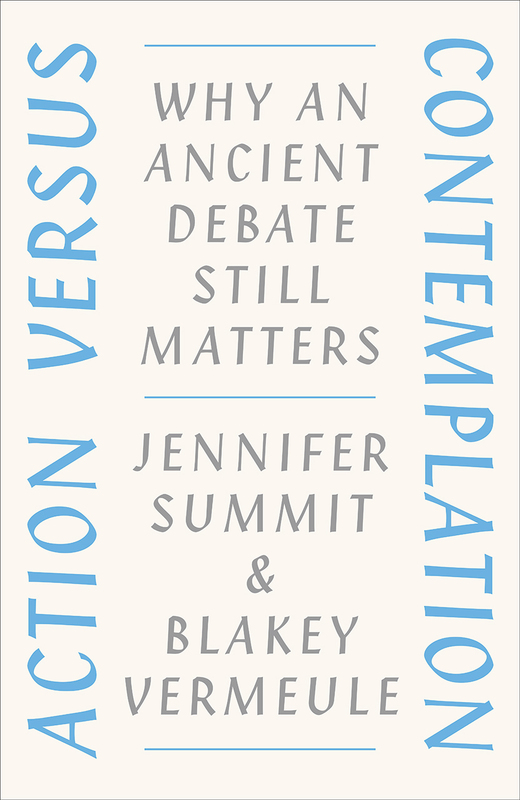 With Action versus Contemplation, Jennifer Summit and Blakey Vermeule address the question in a refreshingly unexpected way: by refusing to take sides. Rather, they argue for a rethinking of the very opposition. The active and the contemplative can—and should—be vibrantly alive in each of us, fused rather than sundered. Writing in a personable, accessible style, Summit and Vermeule guide readers through the long history of this debate from Plato to Pixar, drawing compelling connections to the questions and problems of today. Rather than playing one against the other, they argue, we can discover how the two can nourish, invigorate, and give meaning to each other, as they have for the many writers, artists, and thinkers, past and present, whose examples give the book its rich, lively texture of interplay and reference. This is not a self-help book. It won’t give you instructions on how to live your life. Instead, it will do something better: it will remind you of the richness of a life that embraces action and contemplation, company and solitude, living in the moment and planning for the future. Which is better? Readers of this book will discover the answer: both.